Even though summer’s coming to a close, we should still consider the sun’s impact on our skin. Sun damage can occur at any time; you may get a sunburn on a cloudy day or begin seeing sunspots on skin in the dead of winter. It’s a part of life, but you can protect yourself and your skin against the sun’s rays. So, fear not! We’re giving you all the tips you need for sun damaged skin treatment. In order to heal sun-damaged skin, you first have to recognize the signs. We all know what a sunburn looks like and feels like (ouch! ), but sun damage often goes beyond irritated, peeling skin. The term also applies to changes in skin texture, excessive wrinkling on the back of the neck due to thinning skin. White spots may appear on your arms, legs, and hands. You’ll also notice redness on the sides of your neck. If a lot of these symptoms sound like signs of aging to you, you aren’t wrong. In fact, the sun’s rays can be responsible for up to 80% of your skin’s aging. 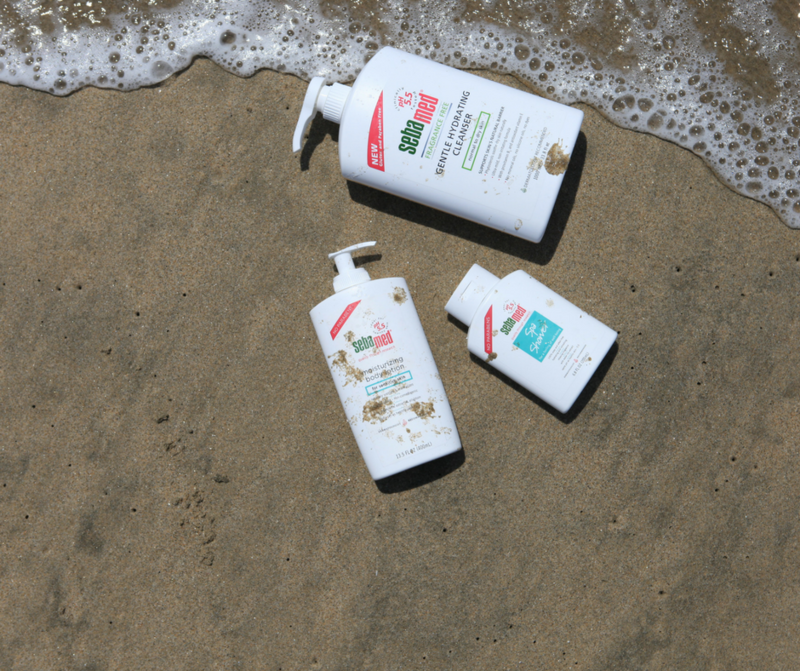 Taking steps at a young age to protect your skin from the sun is absolutely vital! By the time your skin starts turning red and peeling, most of the harm is already done. We recommend easing the pain by applying ice, aloe vera, or petroleum jelly. As for treating the damage to the DNA of your skin cells, there isn’t much you can do. The easiest sunburn treatment is to stop sun damage before it happens, which we’ll get into a little later on. Staying out in the sun for too long drains your body of hydration. As a result, you might see a few flaky patches or dry areas on your skin. We recommend following up a day in the sun with a gentle moisturizer. Just be sure to continue drinking water! Here’s where anti-aging products come in. UV rays break down collagen and can decrease your skin’s elasticity, so restore your skin’s youthful glow with a wrinkle cream and a firming body lotion. Bonus points if your anti-aging moisturizer of choice contains SPF! Sunspots are best treated with prescription or over-the-counter topical remedies, including chemical peels and creams formulated to even skin tone. However, cryotherapy, a treatment involving liquid nitrogen, is also available. One of the easiest ways to safeguard yourself against the sun is to apply a broad-spectrum SPF before exposure. Massage it into your skin every hour, and more frequently if you’re at the pool or the beach. We also recommend dressing in layers, seeking shade, and wearing a hat and sunglasses. Be sure not to expose skin that’s already burnt to the sun. You’ll just worsen the damage. No matter the severity of your sun damage or other skin conditions, we’re here to help. Sebamed offers a wide variety of creams, lotions, and cleansers that restore hydration and heal your skin from the inside out. Check out our complete skin care lineup here.